This compact, secure and durable cart was configured specifically for the iPhones. It is perfect for conference centers, hotels, retail locations, hospitals and companies where multiple iPhones have to be protected, moved, charged and (in some cases) synced. The DS-GR-P-S40-SC has four removable trays, each holding up to 10 devices, even if they are protected with cases. Its dividers are adjustable and removable, which helps protect your investment as your technology changes. 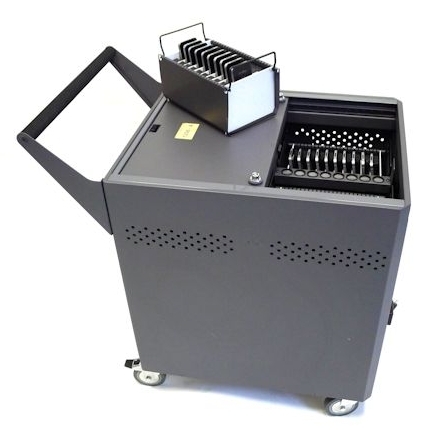 These carts have Datamation Systems’ “Gather ‘Round” design, permitting users to remove and replace technology from both sides, improving efficiency and saving instructional time. And they give you peace of mind with Datamation Systems’ industry-best security, important in protecting your investment in new technology. The sync charge carts are powered by durable, professional USB hubs created by Cambrionix, the leader in mobile USB charging and syncing technologies. They use innovative Cambrionix universal USB hubs that not only meet all Apple requirements but are future-proof: having the only user-updatable firmware so future USB charging profiles for new devices can be updated on the hub with a simple web download. Syncing is done with Apple’s iTune or Configurator or other USB file management or MDM software. Sustainable: Like other Datamation Systems carts, the DS-GR-P-S40-SC uses device-provided cables, reducing waste and lowering costs. They are made with recycled material where possible; energy-efficient design; and durable and adjustable construction so it can change with the newest technology. Includes state-of-the-art universal USB hubs from Cambrionix that meet USB specs for simultaneous charging or syncing (2.1A per port for charging). Hubs contain 40 ports and have exclusive field updatable firmware feature that makes them future-proof, accommodating new charging profiles as new devices are created. For international sales please call 201-329-7200 or email us. iPhone is a trademarks of Apple, Inc. Solutions to Sync and Charge your IPads and other USB devices. Cabinets, carts and safes to secure, sync and charge. 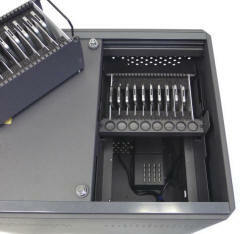 Datamation Systems offers the most comprehensive range of solutions to sync, charge, store and secure your iPads. Travel cases to safely move iPads and USB Sync and Charge devices. Different versions store and deliver 10, 16, 24 and 38 iPads (even when used in most protective cases) and a MacBook™ or other notebook host.